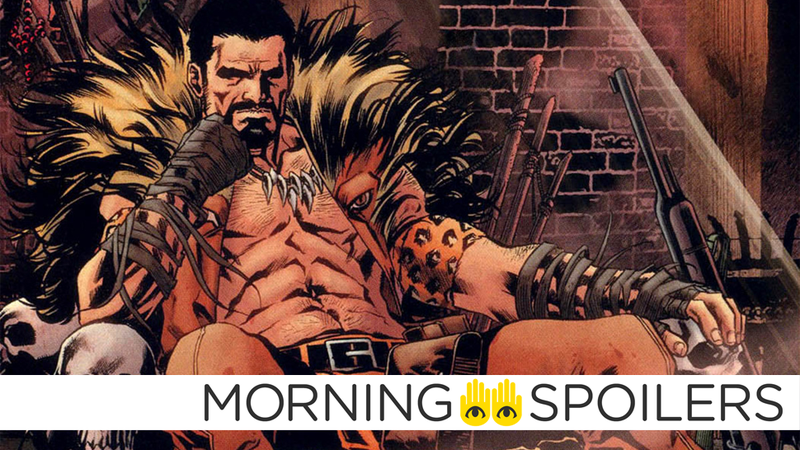 The Kraven movie has taken a tiny step closer to actually happening. The first set picture from the Sonic the Hedgehog movie has emerged. Shane Black talks Predator reshoots. Fox says its Buffy revival is still a way off. The CW’s potential Batwoman show could start filming sooner than expected. Plus, what’s to come in Cloak & Dagger’s second season. To me, my Spoilers! Collider reports that Sony’s in-development solo film based on Marvel’s infamous big game hunter has landed Equalizer 2 screenwriter, Richard Wenk. A new set photo references the game series’ classic opening level set, the Green Hill Zone. Collider spoke to Shane Black for a full fifteen minutes about the recent reshoots in Vancouver. Part of it was we were trying to jam a lot into a five-pound bag. So we had a big appetite. One of the things about that was if you want to do all of this stuff with this much money, you probably need to shoot during the day because during the night would be prohibitive. To our chagrin, and it’s one me, when we saw the footage during the day, the climax of the movie, *exasperated sigh*, it doesn’t look right. It doesn’t look scary in the daytime. Then we decided to streamline the plot so we could go back up and really concentrate on the scarier elements of doing it at night. So literally, as they’ve said, the difference is night and day. We took everything out of day and put it into darkness. Meanwhile, Coming Soon has a thermal vision poster. Coming Soon also has this RealD 3D poster for The Meg, which unfortunately misses the opportunity to evoke Jaws 3D. Elsewhere, a young Arthur Curry is bullied for “talkin’ to the FISH” on the latest motion poster. Jokes on them, ‘cos he grows up to look like Jason Momoa. Oh and like, be King of Atlantis, I guess. Warner Bros. has released the final trailer for their animated yeti movie, Smallfoot. There’s actually no script to see. We’ve sat down with creators and had conversations with them about it. It’s a very exciting prospect. It’s fairly early. We haven’t pitched it to any possible licensees yet, all of that is still to come. We’re thrilled that Joss has engaged Monica who he worked with on one of his other series. She’s the person who is day to day on it. She has a great take on the show. Susan Walters is confirmed to return in season five as Caitlin’s mother, Dr. Tannhauser. Geeks World Wide alleges that the CW’s Batwoman TV series is looking to begin filming in Spring 2019. Still no word on who will play Kate Kane. Billy Eichner hyped the “insane” new season on Twitter. Finally, a quick promo for season two teases Detective Brigid O’Reilly’s transformation into the gaseous vigilante, Mayhem.